Marc shares some of the events that happened on this day in history, including Hank Aaron hitting the first of his 755-major league home runs on this day in 1954 in a game against the St. Louis Cardinals and the death of Cesar Chavez. That was “Siboney,” an early recording by Diosa Costello, whose birthday we celebrate today. She was born in 1913 in Puerto Rico, but grew up in the Bronx. She was a singer, but she was best known for her work on stage. She was the first Latina to appear on Broadway. In 1873, the second of the 5 Anglo-Ashanti Wars broke out in West Africa. It began in 1824, as the Ashanti Empire and Britain went to war after the British attempted to colonize what is now Ghana. The final war did not end until 1902, when Britain set up control of what they called the Gold Coast. An advance in the field of photography was made today in 1895 by a Newton, New Jersey inventor. It was an improved system for washing photographic prints or negatives so that photographs wouldn’t appear “washed out,” created by Cuban-born African-American Clatonia Joaquin Dorticus. And today is the birthday of the “Black Edison,” born today in 1856 in Columbus, Ohio. Granville T. Woods was his name and he held over 50 patents. He is also remembered for his engineering work on streetcars and trains, since he was the first Black mechanical and electrical engineer after the Civil War. Hank Aaron, of the Black players who broke the color barrier, hit the first of his 755-major league home runs on this day in 1954 in a game against the St. Louis Cardinals. Columbia University students in Black and White solidarity took over their university today in 1968 in protest against the Vietnam War and because of the University’s deep involvement in war research. It became one of the most widely-covered and significant protests against the Vietnam War. William Shakespeare was born today in 1564, one of the greatest dramatists of all time. His plays are performed constantly in every nation and every language because in drama and comedy, Shakespeare’s plays speak so deeply to the human condition. Blair Peach died today in 1979. He was a New Zealand native, anti-racism activist and member of the Anti-Nazi league. He died from injuries sustained during a bloody clash between demonstrators and police in in Southall, London. 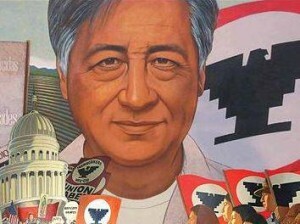 And Cesar Chavez passed away on this in 1993. He founded the United Farm Workers, creating a union of grape and vegetable pickers who went on strike that shook the nation. Cesar Chavez created the national boycott of grapes and led to rights for farm workers. And for your soundtrack on this day, April 23rd. President Ronald Reagan presented the National Medal of the Arts to two important people today in 1985. One of them was writer, scholar and critic Ralph Waldo Ellison, who won the National Book Award for his timeless book Invisible Man. There’s one interesting fact about Ralph Ellison I wanted to share. He grew up in Oklahoma City and his father died when he was 3 years old. When Ralph was older, he would learn that his father had always hoped he would grow up to be a poet.